Each of the rhythms on this recording evolved out of the unique sound of the frame drum. The frame drum is the world’s oldest known drum and for thousands of years was the primary trance inducing technology for religious and ecstatic rituals. It is the oldest spiritual means for directly synchronizing the mind/body for accessing higher levels of awareness. 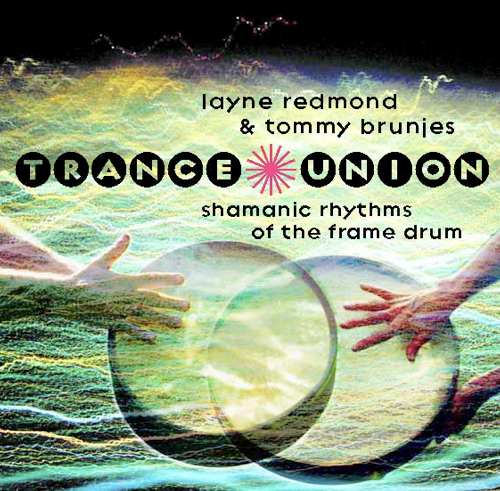 “Trance Union features Layne Redmond and Tommy Brunjes performing on a variety of percussion instruments with frame drum being the centerpiece instrument. 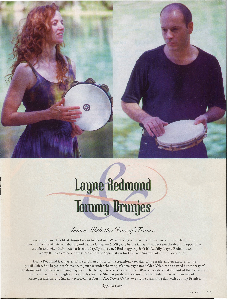 All selections on the recording were composed, arranged and produced by Redmond and Brunjes. The seven tracks are "Tenfold," "Seeds of Fire," "Bumba Meu Boi" "Morrocan Moon," "Tumbao," "Seven Sent" an "Translucent Path." Instruments utilized on the recording include tar, Tibetan bowls, doumbek, shakers, Balinese cymbals, windwand, conga, Indian bells, matracas, Indian elephant bell, bendirs, Lotus Tamborine, whirling tubes, pandeiro, small Nepalese barrel drum, djembe, berimbau, kanjira, maracas, jingle ring, cicada metal rattle, finger cymbals, vibratone, string bells and bodhran. The mix of all these instruments is excellent -- clear but resonant.